The 97-mile Kanawha River is the largest inland waterway in West Virginia (WV). It drains roughly a third of West Virginia and parts of western Virginia and western North Carolina. Many geographers consider the New and Kanawha to be the same river. The river below the mouth of Gauley River is called the Kanawha. Above the Gauley, it is called the New River. The Kanawha is formed by the junction of New River and Gauley River just above Kanawha Falls, near Gauley Bridge, West Virginia. The mouth of the Kanawha is located on the Ohio River at Point Pleasant, West Virginia. Other tributaries of the Kanawha in West Virginia include the Elk River, the Coal River, and the Pocatalico River. The Kanawha River flows northwest through northern Fayette County, northern Kanawha County, central Putnam County, and central Mason County. 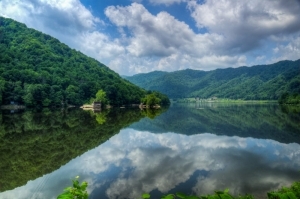 Natives and European settlers considered the New River and Kanawha River as one river. Thomas Jefferson was among these early chroniclers and referred to both as “the Great Kanhaway” in his Notes on the State of Virginia. Early explorers used the Kanawha as a westward thoroughfare. The Morris family settled at modern-day Cedar Grove, near Charleston, WV, in 1775, and established a boat yard that served travelers headed west. In 1819, the first steamboat to navigate the Kanawha River plied upstream toward Charleston as far as Red House Shoals before returning to the Ohio River. The failure convinced the Virginia Assembly to appropriate funds to improve the passage, and in 1820 the Albert Donnally ascended to Charleston, and the traffic by river increased thereafter. From source to mouth, the following select cities, towns, and villages are located on or near the Kanawha River. Information on lodging, dining, and recreation on and near the lower Kanawha River, downstream of Buffalo, WV, may be found in our guide to travel in the Mid-Ohio Valley Region. Information for the upper river, between Buffalo and its source at Gauley Bridge, may found in the Metro Valley Region. Information for the upper segment above Gauley Bridge may be found in the New River Gorge Region. The Kanawha is also a feature in the Fallout 76 video game.